​Manchester City manager Pep Guardiola praised Sergio Aguero for his hat-trick following his side’s 3-1 win over Arsenal on Sunday afternoon. The Citizens secured three points thanks to three goals from Aguero, as the Argentine striker got his tenth Premier League hat-trick in his career. He is now second in the number of Premier League hat-tricks scored, just one behind the league’s all-time leading goalscorer Alan Shearer. 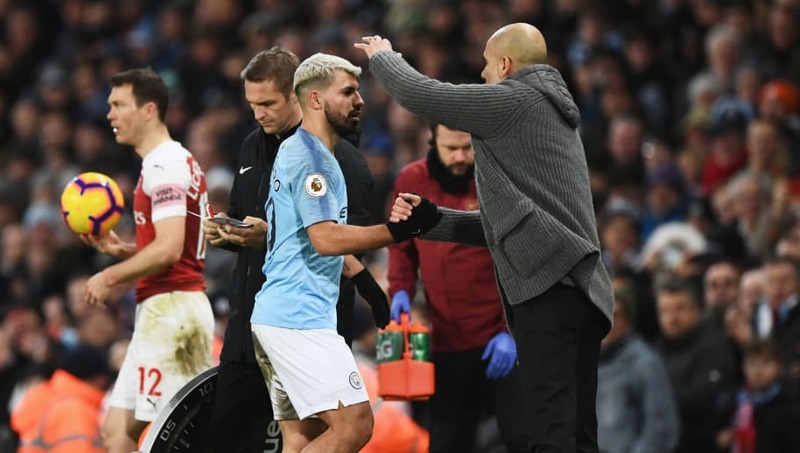 Guardiola was keen to praise Aguero for his performance, as he spoke in his post-match press conference. As quoted on the club’s official website, he said: “From the beginning, I was very pleased. Today he fought and did everything for the team. ​Aguero’s hat-trick took his season tally up to 20 goals, the most in ​Manchester City’s squad this season. He is now joint-third in the Premier League Golden Boot race with 14 goals, alongside ​Tottenham striker ​Harry Kane. City’s win on Sunday afternoon moved them within two points of league leaders ​Liverpool, who face ​West Ham on Monday evening. It was a much needed victory for the Citizens, who ​lost 2-1 to Newcastle last Tuesday. The gap between first and second is now just two points, though could be restored back to five if the Reds prevail at the London Stadium. City now face two league fixtures in four days, starting on Wednesday night when they travel to Goodison Park to face ​Everton. They then return to the Etihad on Sunday, as they host ​Chelsea in a huge clash.